Kathy Simmons cuts a garden plot Sunday at Sherrie and Jason Brann's home in Sidney with a pair of Percheron that belong to her father, Pete Stratton. 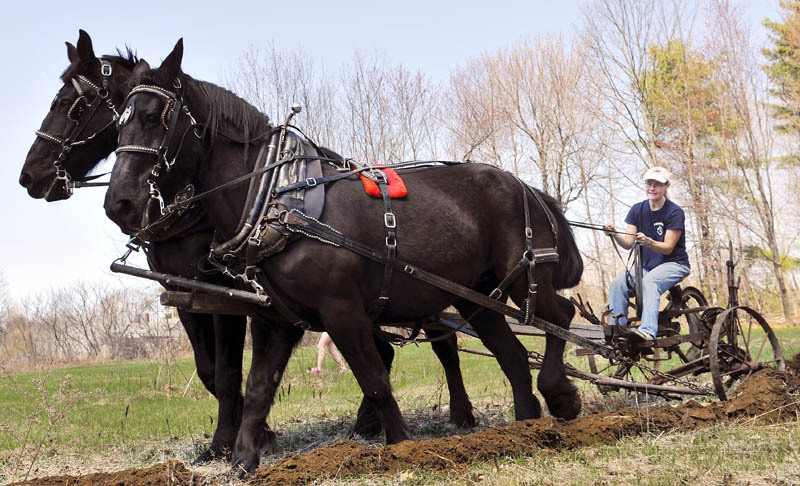 The team pulled a Syracuse Sulky Plow from the 1920s through an acre of soil with the Brann family and friends picking up stones that emerged in the furrow. Stratton said he plans to return and harrow the plot later. Kathy Simmons cuts a garden plot Sunday at Sherrie and Jason Brann’s home in Sidney with a pair of Percheron that belong to her father, Pete Stratton. The team pulled a Syracuse Sulky Plow from the 1920s through an acre of soil with the Brann family and friends picking up stones that emerged in the furrow. Stratton said he plans to return and harrow the plot later.